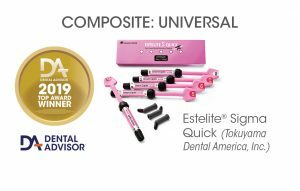 Estelite® Sigma Quick is a low-shrinkage, submicron-filled composite for use in both anterior and posterior restorations. 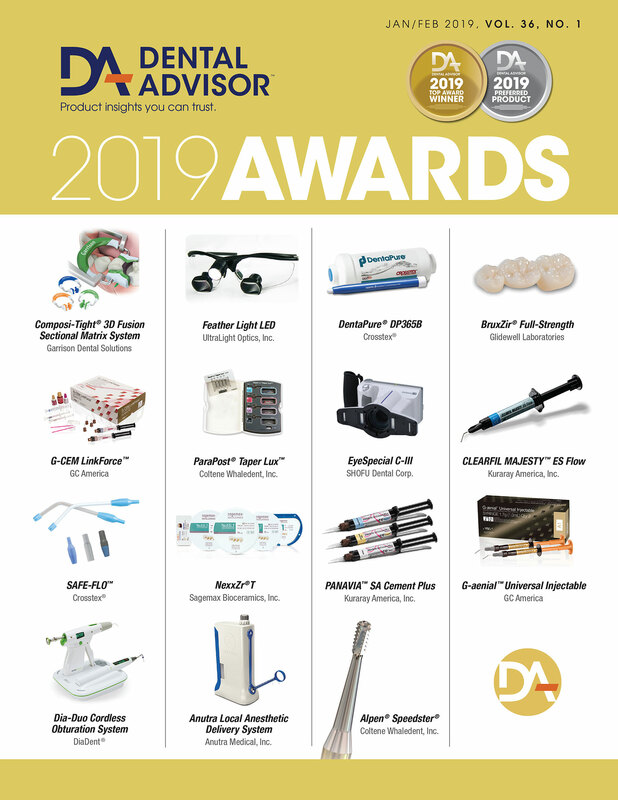 This enhanced version of Estelite Sigma implements RAP technology (Radical-Amplified Photopolymerization initiator technology), which offers increased working time of 90 seconds under ambient light, while decreasing curing time to 10 seconds with a halogen light. Estelite Sigma Quick contains 82% by weight of silica-zirconia filler. The composite is available in both syringes and pre-loaded tips (PLTs) in shades A1, A2, A3, A3.5, A4, A5, B1, B2, B3, B4, C1, C2, C3, OA1, OA2, OA3, OPA2 (opalescent), BW (bleach white), WE (white enamel), and CE (clear enamel). This product received a 99% clinical rating. Estelite Sigma Quick was evaluated by 21 editors who placed nearly 1200 restorations. Editors rated both the packaging and instructions as very good. The instructions are clear and thorough. Packaging is clearly marked and easy to store; however, some editors commented they would prefer having all the shades available in one box. The pre-loaded tips (PLT) are each labeled with the name and shade for easy identification. The ease of dispensing from the PLT is among the highest rated features. It flows well and stays where placed. The ease of placement and workability of this composite are excellent. Editors liked the packability as well as the capacity to work well with most bonding agents. The lack of stickiness to instruments was also rated very good. The complete assortment of shades offers superior versatility. The system is comprised of 20 shades, 4 opaque, bleach white, as well as white and clear enamel. Shade matching both before and after curing is excellent with minimal shade shift. The composite blends exceptionally well with the surrounding tooth structure. Editors felt the material was not too opaque and had very good translucency. The radiopacity was very good. The composite is not overly sensitive to ambient light and has an extended working time compared to the original Estelite Sigma. Editors reported Estelite Sigma Quick was easy to polish and provided a highly satisfactory finish. Overall they were extremely impressed with the final polish and excellent esthetics of this material. Use a nylon (plastic) instrument for anterior incisal edge/angle restorations when layering shades. The flexibility of the instrument and viscosity of the composite work well together to allow feathering of the composite before curing.